The author’s wife has a Fast Tag for the Mersey Tunnels issued on disability grounds, therefore she does not have to pay the tolls referred to below. Yesterday (at the time of publication which you can watch above) was the annual public meeting where councillors on the Transport Committee (formerly called the Merseytravel Committee) of the Liverpool City Region Combined Authority made a recommendation on the Mersey Tunnel tolls (although the final decision will be made after this article is published by a different set of politicians on the Liverpool City Region Combined Authority). Wirral Council has four councillors (Cllr Steve Foulkes (Labour), Cllr Ron Abbey (Labour), Cllr Les Rowlands (Conservative) and Cllr Jerry Williams (Labour)). 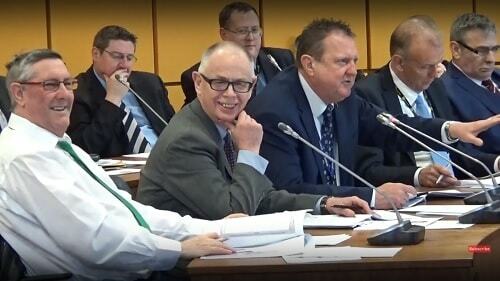 Cllr Les Rowlands wasn’t present, which drew the following response from Cllr Foulkes, followed by an explanation. CLLR STEVE FOULKES (LABOUR): The second thing I am shocked and amazed at, through you Chair, no disrespect to Les Rowlands as an individual. This is a big Wirral issue and I know there’ll be a debate about issues later on. But I am informed, reliably informed, that Cllr Les Rowlands has not attended today, due to the fact he is on holiday. Now you can have your holidays any time of the year and as a Wirral representative, I do hope Mr Brace’s camera focuses on, no it’s not an empty chair, I think they’ve put a coat over it to make people think he might be coming later on. COUNCILLOR MIKE WYNN (LIBERAL DEMOCRAT): Point of order, Mr Chairman. CLLR STEVE FOULKES (LABOUR): just I’m allowed to speak! Without interruption I would have assumed! I’m not going to presume what debate takes place later on. I have the greatest regard for Les, but I think, if he was having his holidays, this has been in the calendar for a very, very long time, when we do this and Les has been around an awful long time, to not actually be here to vote on the crucial issue, I think, you know it’s for him to answer not for me, it’s for me to make comment because I’m allowed to do so. However, all in all, I think it’s a genuinely positive move in the right direction, apart from the ten pence increase, which I will take leave to possibly probably vote against. Thank you. CLLR LIAM ROBINSON (CHAIR, LABOUR): You wanted to raise a point of order? CLLR MIKE WYNN (LIBERAL DEMOCRAT): Just a point of order on the point he raised about the coat on the chair, it has got nothing whatsoever to do with the fact that we are trying to disguise the fact that Les is not here. I have put that, I have put the coat on the chair because I didn’t want it creasing, because of my body leaning on it. Thank you Mr. Chairman. Despite talk of a motion proposed by the absent Cllr Les Rowlands about the tolls, legal advice given to councillors by Louise Outram (a solicitor working for Merseytravel) ruled that Cllr Rowland’s motion couldn’t be voted on because of The County of Merseyside Act 1980. The text of Cllr Les Rowlands motion wasn’t shared with the press or public. The recommendation in the report was carried by 13 votes in favour, 6 against with 3 abstentions. If agreed by the Liverpool City Region Combined Authority today, it will result in a 10p increase in cash fares from April 1st 2018 from £1.70 to £1.80. Again, if the LCRCA agree today, the Fast Tag amount will be £1 between 7pm and 7am and all day Sunday, but £1.20 at all other times. The Mersey Tunnel Users Association were present at the public meeting and oppose both the proposed increase and the tolls themselves. « What are Wirral Council’s budget proposals on garden waste and cuts in services to the Irish community? And the opposing Wirral Councillors, led by the husband of an alleged #Racist – Steve Foulkes – are cynically exploiting their bogus ‘opposition’ as a platform to curry lots of ignorant people’s votes in the upcoming May 2018 local council elections. We are VERY poorly served. Well none of those three have a term of office that ends in 2018, but yes on the grapevine there’s plenty of chatter about Birkenhead and Tranmere (where indeed one of the Mersey Tunnels starts). The question needs to be asked why they have to rise! Paying the loan back? or more money for Merseytravel? I take it the Council will be reducing Council tax to off set this toll rise, as less face it we get no service from the council as it is, Libraries never open, streetlights out, no road repairs, street signs rusting, grids blocked and roads flooded, litter all of the place, empty houses etc etc? Wirral looks like Germany did after the second world war ended, a **** ****! This ten pence rise will now lead to more higher food rises and more people visiting food banks, *******! I think the answer to it is more money to Merseytravel to do things like subsidise the Mersey Ferries and commission a new one, subsidise bus services etc. From what I remember Merseytravel is freezing the levy it charges Wirral Council for the matters it provides on its behalf in 2018-19 at 2017-18 levels. Council tax on Wirral is not planned to be reduced in 2018-19 but to go up by the maximum of just under 6%. This is the maximum it can increase without a referendum of local people.